So the beautiful weather continued and we made it to Lake Louise Village where we went to the visitor center. 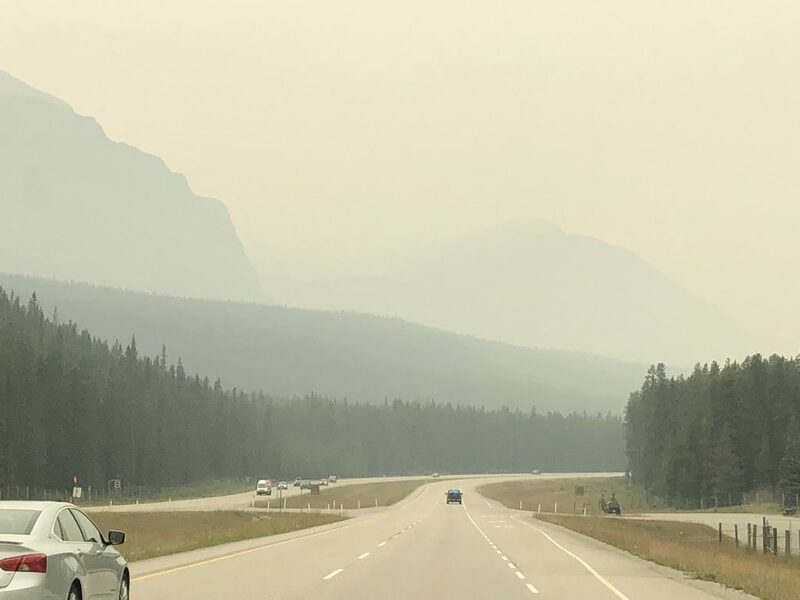 The number of tourists in Banff is quite unbelievable July and August are the worst times to be there. But our plan was to follow the advice of the gal at the visitor center and take our kayak up to Lake Moraine at 7:30 that evening and then drive up to Lake Louise at 7 the next morning to beat the crowds. These were the two main things I wanted to do. And then a few hours later, this. The smoke came in so quickly. No way will see those beautiful lakes. Our plans after that were to go to glacier national park in Montana. After doing some research I discovered that there were fires in Glacier too. That’s it! Between the tourists and the smoke, we are done. Heading home. And to be honest, after being gone almost five months, we are ready to head home. 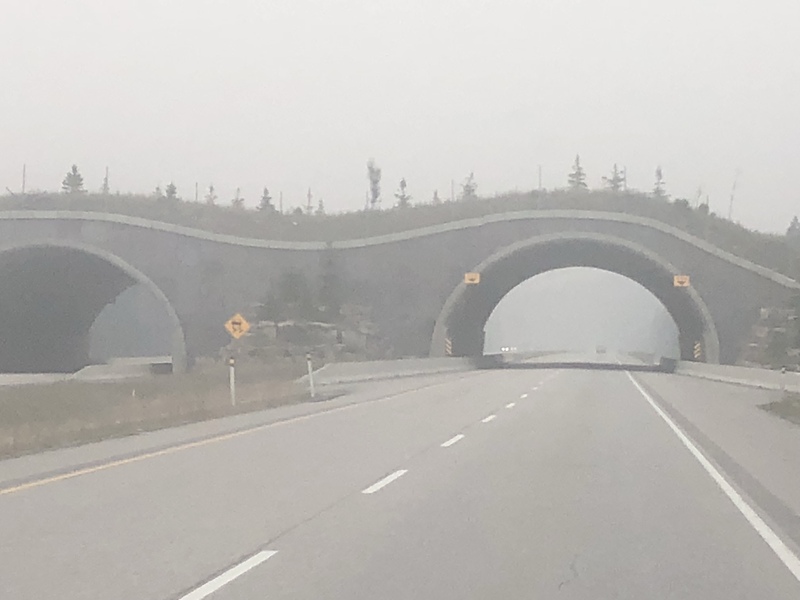 In Banff, they have built these bridges for the wildlife to cross the road safely. Here’s a little bit of blue sky in Montana. It is so beautiful and we will definitely be back! We hope to be home on Saturday! The smoke is unbelievable! You’ll be back in the area again. Come on home, we’ll be glad to have you back. On a better note, Montana is where some friends of mine moved a year or so ago and are LOVING it – showing off their picturesque surroundings trying to make us all jealous! So it’s a place to check out on your next adventure. Have safe travels back. That’s so sad, Diane …what a disappointment. I just hate seeing such beautiful places so devastated by fire. Hope you have a safe trip home, and thanks again for sharing your trip with us! The smoke is so bad. The sky here is smoke covered too, no clear blue. The sun sets and is an unusual red,orange. Our kids have said the ash at their homes from the Holy fire is bad. Thanks for posting all your adventures, it’s been fun to see them. Oh that’s awful Diane. Be safe in your travels.